In 1993 Greg Mortenson was the exhausted survivor of a failed attempt to ascend K2, an American climbing bum wandering emaciated and lost through Pakistan's Karakoram Himalaya. After he was taken in and nursed back to health by the people of an impoverished Pakistani village, Mortenson promised to return one day and build them a school. 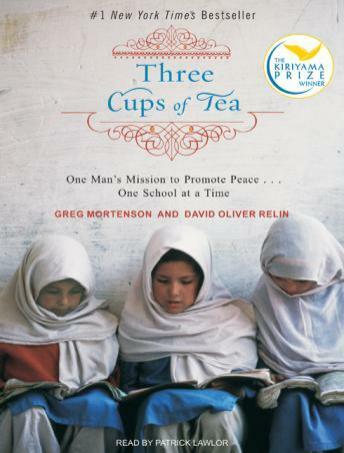 From that rash, earnest promise grew one of the most incredible humanitarian campaigns of our time-Greg Mortenson's one-man mission to counteract extremism by building schools, especially for girls, throughout the breeding ground of the Taliban. Award-winning journalist David Oliver Relin has collaborated on this spellbinding account of Mortenson's incredible accomplishments in a region where Americans are often feared and hated. In pursuit of his goal, Mortenson has survived kidnapping, fatwas issued by enraged mullahs, repeated death threats, and wrenching separations from his wife and children. But his success speaks for itself. At last count, his Central Asia Institute had built fifty-five schools. Three Cups of Tea is at once an unforgettable adventure and the inspiring true story of how one man really is changing the world-one school at a time. After I listened to the whole story I found out the author is being sued for making a lot of it up and defrauding donors. Kind of spoils the story. Even with all the scrutiny Graig Mortensen has received in the recent months, this book is still very enlightening. Greg gave this rural region of the world a voice, a few schools, and the rest of us a deeper cultural understanding and appreciation. This is an inspiring book. I admit I am only half way thru this CD, but I have already put Stones into Schools on my list. This is an interesting story, but the writing wasn't the best. The writer seems to assume that the reader already knows Greg Mortinsen's story, which I didn't. It took forever to get to the meat of the story. By then, the book was almost over. Mr. Mortinsen's story is really inspirational and moving. He's an admirable guy, and the story is really interesting, too. The narrator, who was clearly American, drove me crazy with the absolutely terrible attempt at foreign accents. For the first few discs, I thought all attempts at accents sounded like Russian, which none of the characters were. By the end, I found myself cringing everytime he said the word, "Pack EE stan". Never-the-less, the story is good enough to bear through the bad spots. What an amazing story of the difference one man's life can make. It makes me realize that all children are made in the image of God and they all need education. I hope this story goes on and on forever. The descriptions of the places and the people are wonderful. The book gives hope that people will see good in us if we see good in them first. This was a great book. Persistence is the key to greatness and Greg Mortenson never lost sight of his vision. His story is amazing and demonstrates what one man can do when he believes in something as wholehearted as Greg did. I learned alot about the Muslim culture as well as how we as Americans have a lot to learn about this part of the world. In the end, we all want the same things for our children. This is an amazing book. I really enjoyed it. Typically, I read mysteries or fun stories, so this was much more serious than I normally go for. A friend recommended it so I signed up for it. It really was an amazing story. I enjoyed the whole book, and it was quite eye-opening. It is truely awesome what he was able to accomplish. I think that all political leaders of this country should be required to read this book. There are other ways to change a situation without bombing. I hope that Greg is still building schools today. Ah, this story not only kept me entertained but inspired me to action. Thank YOU Greg Mortenson. Interesting read. Amazing man Greg Mortenson. Liked it. Greg Mortenson is a man of humble background who has done something great for people even more humble than himself. Mortenson is also not great at expressing himself, and even less good at promoting himself, so David Oliver Relin has done the world the favor of writing Mortenson's story, with Mortenson's help. It is a good story about projects in Pakistan and Afghanistan--parts of the world Americans understand way too little, but where we spend way too much money for destructive ends. This could be the most important book for you to read this year.